Compared with hardware, plastics have better plasticity, can shape products with more complex structures, and can effectively reduce the weight of products. It has been widely used in consumer electronic products or household appliances, smart products. But there are still some shortcomings in plastic products, such as the strength of plastic, the texture of plastic, compared with metal products, there are still some gaps. So how do we make plastic products metal strength and have a metal texture? As far as our Mercedes-Benz aromatherapy product is concerned, it's completely done. Yes, you're right! 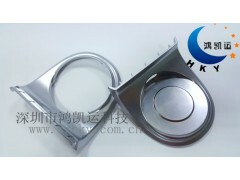 This is not a hardware mould, but a plastic product formed by plastic mould. Subsequently, the surface of the product is treated by electroplating. Compared with ordinary electroplating, the electroplating layer of this product is 0.15mm thick, with metal strength and impact resistance, and is much harder and lighter than ordinary aluminium alloy or zinc alloy.